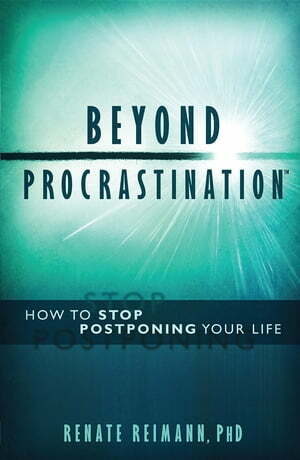 Collins Booksellers - Beyond Procrastination™ by Renate Reimann, 9781939195012. Buy this book online. Procrastination is a part of life. Some is fun, some is inconsequential and some does serious damage to our well-being. This book helps the reader to stop the negative kind. The Beyond Procrastination™ program, laid out here and based on real-life successes, charts an easy and effective path to greater productivity, increased confidence and a more balanced life. Beyond Procrastination™ faithfully covers traditional topics such as time management, organization, fear and perfectionism. But it also digs deeper, examining the larger socio-cultural picture of why procrastination is more prevalent than ever. In the face of relentless competition, electronic overload and pressured workplaces many use postponing tasks as an emergency break. Procrastination is not only a practical issue but one that carries enormous moral stigma. This book tells the stories of many talented and ambitious people who lost precious time and energy on feeling guilty about not living up to their potential. Working this program they were able to let go of the shame, clarify their true dreams and achieve them. For maximum benefit, the book is designed for complete flexibility and immediate impact. While the chapters build on each other, opening up the book at any page will provide tricks and insights that can be implemented on the spot. Even the shortest attention spans will be able to garner something useful. In the author's view, there are always valid reasons for procrastinating. Hence, Part 1 tackles why we delay tasks and projects that are important to us. Part 2 then provides the tools to deal with various root issues and solve almost any procrastination scenario. Finally, the book addresses how to stay the course long-term - something especially relevant to minimizing procrastination.